Finally my creativity has resurrected itself... I was productive again. Feels good. So this is one of the cards I made in the last couple days. The quilling was mostly done at the last session with the gals. It's been a while since I did a window card - hard to photograph - sigh. 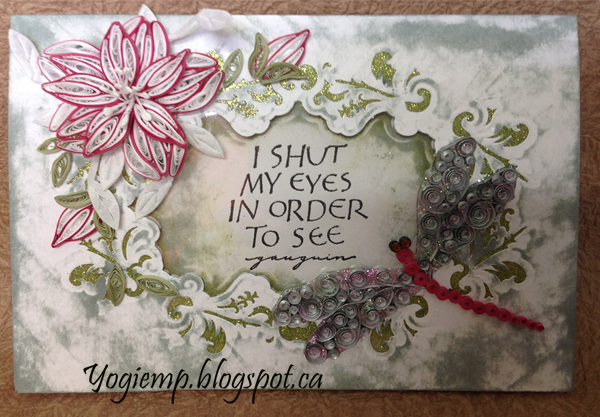 I'm using a Quietfire Design quote stamp "I Shut My Eyes...". I loved the quote when if came out, but I think this is the first time I've used it. Anyways, you can see all the details, descriptions and more images by clicking on any card image. Enjoy. Oh, my, Yogi! Your creativity certainly has resurrected itself! I had to take a very close look at your flower to see how you did the quilling. That's amazing. 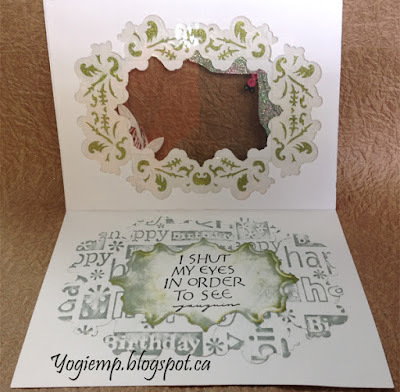 Love the frame and background and the partial embossing inside. Beautiful all over! Beautiful!! The cut out window is really cool (and, I agree, super difficult to photograph! 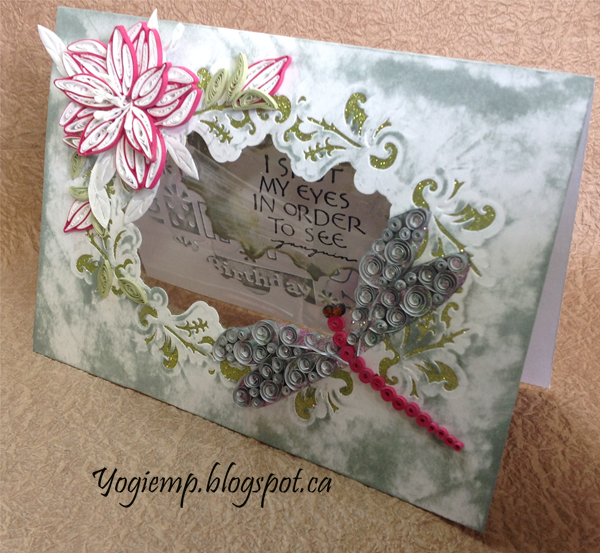 ), the flower is gorgeous and that quilled dragonfly is fabulous!! That must have taken a looooong time! Love the quote, too. Thanks for playing with The House That Stamps Built. That is stunning! I've never tried quilling, but it looks like fun. A beautiful card, I love the detail in the dragonfly. Thank you so much for sharing with us at Alphabet Challenge.